Added to our Focus List – Long Model Portfolio on November 14, 2018. Micro-bubbles happen when the media and noise traders fixate on certain trends or narratives and ignore underlying fundamentals. The opposite can also be true – below-the-radar economic trends can lead to undervalued stocks. This company benefits from an unprecedented surge in freight demand, an economic story that has received relatively little attention due to the focus on tax cuts and tariffs that have dominated 2018. Understated earnings and a recent change to executive compensation plans also make this company a better value than most investors realize. 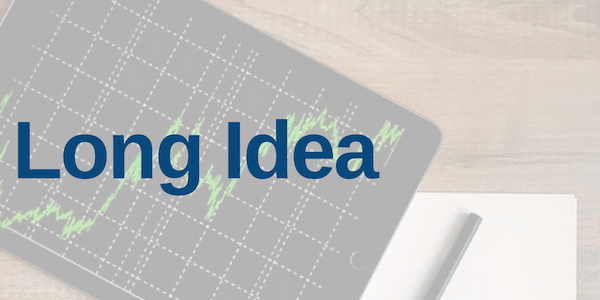 Cummins Inc. (CMI: $145/share) is this week’s Long Idea. Orders for Class 8 trucks (aka semi-trucks) are expected to hit 450,000 thousand in North America in 2018, the largest recorded amount since at least 2004. This surge in demand has been a significant boon to Cummins, which is the largest supplier of Class 8 truck engines and has a 40% market share. However, accounting earnings don’t reflect this improvement in the business. Reported earnings per share are down 21% year-over-year for the trailing twelve months (TTM) period. Figure 1 shows how reported earnings, which have historically been higher than net operating profit after tax (NOPAT), understate profitability for 2017 and the TTM period. Combined, these two items add up to $1.2 billion, and they explain why Cummins’ TTM reported earnings are just $1.3 billion while its TTM NOPAT is $2.2 billion. The combination of understated earnings and less media attention lead investors to underrate the strength and growth of Cummins’ business. Due to Cummins’ rapid growth and its investments in new technologies, such as electric vehicles, the company implemented changes to its executive compensation program at the beginning of 2018. Because these new investments mean the company may incur more debt in the future, the board decided to replace return on equity (ROE) with return on invested capital (ROIC) as the target for its long-term incentives. 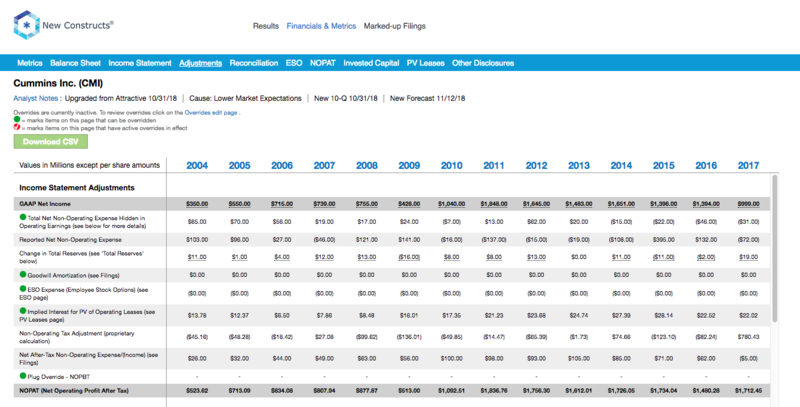 We applaud this shift, as ROE is not a useful metric for investors. It can be influenced by leverage, which is Cummins’ reason for making the change, but it also relies on flawed accounting earnings and ignores off-balance sheet items. 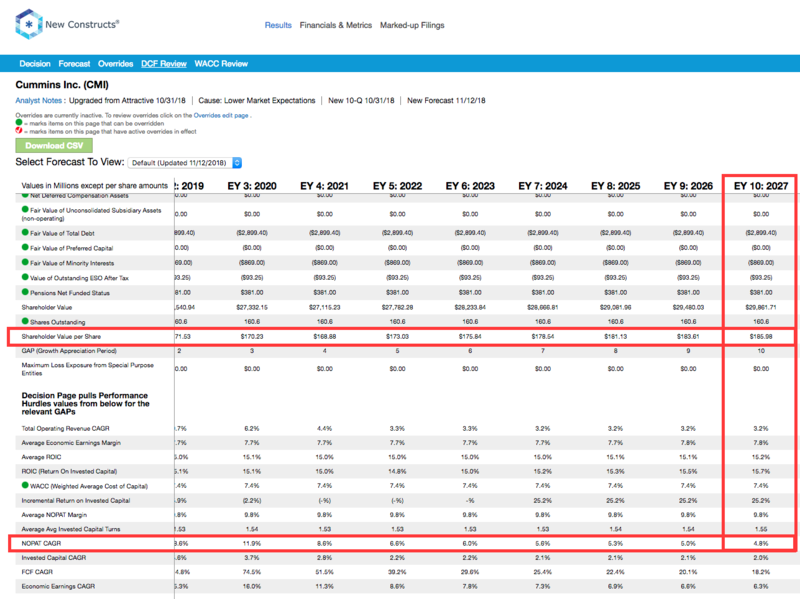 ROIC is a superior metric that has a much more significant link to valuation. Per Figure 2, ROIC explains 49% of the difference in valuation for the 32 Auto, Truck, and Motorcycle Parts peers under coverage. Despite CMI’s 15% ROIC, which is well above the 9% average of the peer group, the firm’s stock trades at a slight discount to peers as shown by its position below the trend line. If the stock were to trade at parity with its peers, it would be $155/share – 7% above the current stock price. Given the firm’s rapid profit growth and superior corporate governance, one would think the stock would garner a premium valuation. As discussed earlier in this piece, Cummins has the leading market share in the Class 8 truck engine market. Cummins is the only major independent engine manufacturer remaining in the industry. Its primary competitors are also its main customers – companies such as Daimler, Volvo, Paccar (PCAR), and Navistar (NAV) that have to make the choice between building their own engines for their trucks or buying from Cummins. To stay competitive, efficiency and profitability are extremely important to Cummins. To retain its most lucrative customer base, it needs to demonstrate the ability to make engines more cheaply and profitably than the truck manufacturers themselves. As Figure 3 shows, CMI has maintained a consistent ROIC advantage compared to the peer group in its proxy statement over the past five years. With its new emphasis on ROIC, we expect Cummins’ advantage will only grow more significant moving forward. While accounting distortions mask some of the growth in Cummins’ business, some investors that recognize the underlying profitability may still be skeptical of the company’s long-term prospects. Trucking is, after all, a cyclical industry, and after nearly a decade of economic expansion, many analysts expect a downturn in the near future. However, the underlying economic data suggest that the trucking industry may still be a ways away from the cyclical peak. The backlog for Class 8 orders is at ~300,000 vehicles – nearly a years’ worth of production – and continuing to grow. In addition to economic growth, the rise of e-commerce provides a boost to shipping demand that should continue even in a downturn. Digging deeper into Cummins’ financials, we see signs that the company’s business has not yet hit the same heights as it did in the previous cyclical peaks of 2006 and 2011. Figure 4 shows that the company’s average invested capital turns – the amount of annual revenue per dollar invested in the business – remain well below the peaks of those previous cycles. CMI’s TTM capital turns of 1.5 remain well below the 2.2-2.3 level it has hit at previous cyclical peaks. Part of this decrease can be attributed to the company’s long-term investments in EV’s and other technologies that don’t generate significant revenue yet. However, even if we ignore these long-term investments, CMI’s current working capital turns of 6.3 still lag behind previous peaks that have topped 7. In addition, TTM revenue growth of 19% is still well below the 30+% annual growth achieved at those previous cyclical peaks. Taken together, these numbers all suggest that CMI still has room to grow before the cycle turns. Longer-term, the primary bear case against Cummins revolves around the fear that electric semis will replace diesel and natural gas counterparts. Despite its solid profit growth, CMI is down 15% over the past year while the S&P 500 is up 6%. Not coincidentally, the Tesla Semi was announced almost exactly a year ago. The Tesla Semi was originally announced to begin production in 2019, and its specifications would allow it to compete in nearly 2/3 of the Class 8 market, according to analysts. However, as with many things involving Tesla (TSLA), there’s a disconnect between the hype and the reality. Recently, a prominent investor announced that production on the Semi wouldn’t begin “in earnest” until 2020. Battery experts have declared that Tesla would need to “break the laws of batteries” in order to achieve the range and recharging times it promises. We’ve seen consumers willing to tolerate Tesla’s production delays and overstated marketing claims in the past, but it’s doubtful that businesses can be as lenient. Many companies have placed small orders for the Tesla Semi, but no one’s going to make a big (capital intensive) commitment until the company can prove its ability to produce orders on-time and at scale, not when significant revenues and customer relationships are on the line. Meanwhile, Cummins looks set to get an electric semi on the road before Tesla, with a 140 kWh electric power train slated to begin production next year. Cummins’ battery-powered engine will be used for Class 7 trucks, which typically focus on deliveries within a single city rather than long-haul trips. As e-commerce drives a greater focus on “last-mile” delivery, the demand for these trucks should continue to rise. These different approaches highlight the difference between a consumer-facing company and a business-facing company. Tesla has benefited in the past from lots of free media by making over the top claims. This strategy has helped it build a dedicated consumer following. On the other hand, Cummins knows how to build lasting relationships with business partners. By sticking to a more modest and achievable goal, Cummins can build trust with its partners and be the go-to choice when battery technology advances to the point of making electrification of Class 8 trucks achievable at scale. People tend to think of Cummins as solely an engine company, but its business is significantly more diversified than the market appreciates. In addition to manufacturing engines for semi-trucks, Cummins manufacturers and distributes a wide array of automotive and industrial components, as well as power generators. Figure 5 shows the breakdown of Cummins’ Q3 revenue by segment. 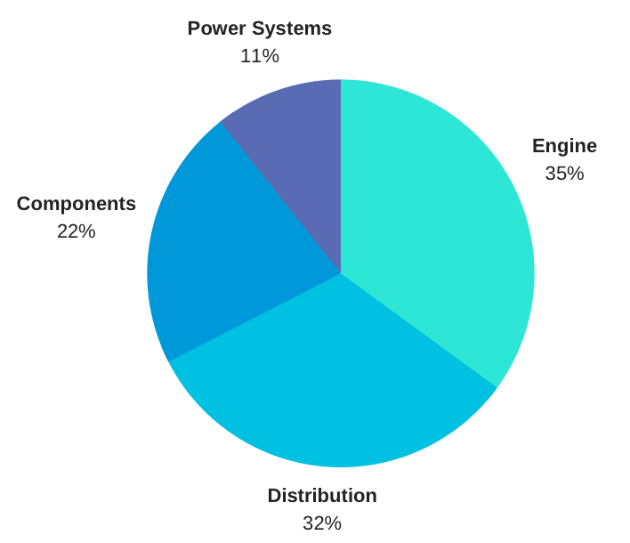 The distribution segment primarily distributes products from the company’s other segments, and the components segment often sells to the same customers as the engine segment. Yes, these segments are tightly-linked, but there’s no inherent reason these segments have to be linked. If Cummins did lose market share in the engine space, the components segment could shift to sell parts that complement other powertrain systems, and the distribution segment could partner with other manufacturers. As stated above, we don’t think that scenario is likely, and the bull case is that all these segments continue to operate as highly complementary and profitable units. However, the diversification of Cummins’ assets does provide some measure of protection even in a bearish scenario. The company’s solid balance sheet should also reassure investors. Its debt is growing, but remains relatively low at $2.9 billion (13% of market cap). Meanwhile, Cummins stands out as one of only a handful of companies with a fully funded pension plan. In fact, its pensions are overfunded by $381 million. Despite the strong fundamentals and solid balance sheet, CMI is cheap, whether analyzed through traditional valuation metrics or the expectations baked into the stock price. At its current price of $145/share, CMI has a P/E ratio of 18, well below the S&P 500 average of 22. That low P/E ratio is especially notable when we consider the accounting distortions that lower CMI’s reported earnings. When we analyze the cash flow expectations baked into the stock price, we see that CMI is even cheaper than it first appears. 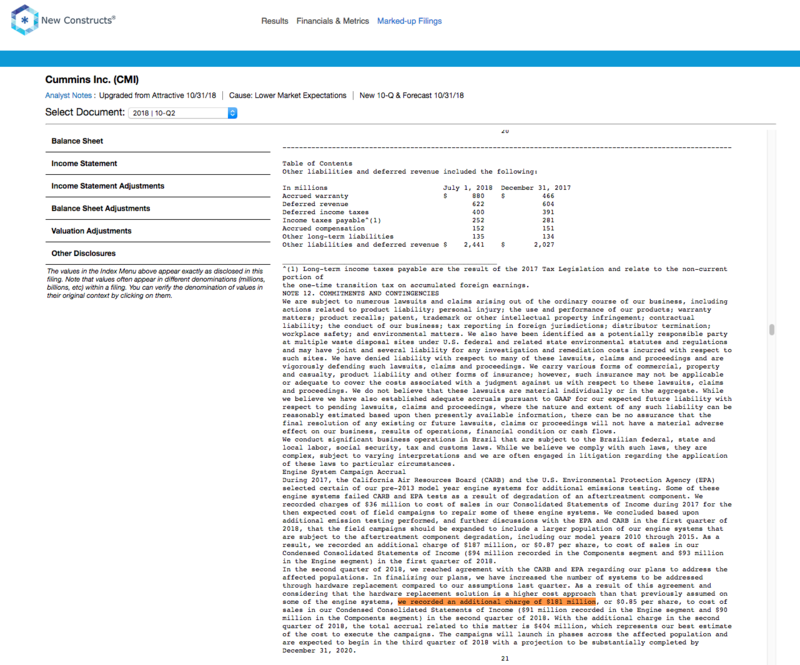 At its current price of $145/share, CMI has a price to economic book value (PEBV) of 0.9. This ratio means the market expects CMI’s NOPAT to permanently decline by 10%. This expectation seems pessimistic given that CMI has grown NOPAT by 8% compounded annually over the past decade and 10% compounded annually since 1998. Such pessimistic expectations create large upside potential. 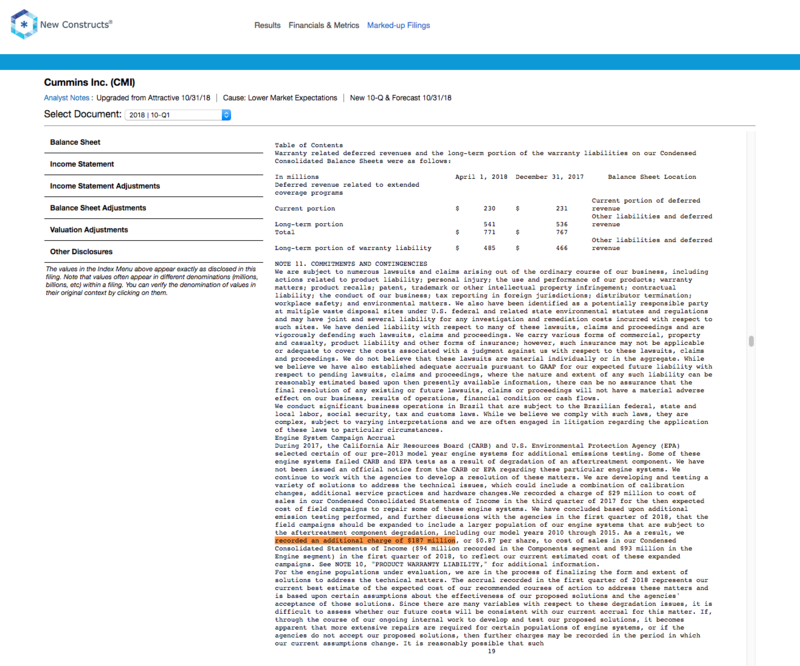 If CMI can grow NOPAT by just 5% compounded annually over the next decade, the stock is worth $186/share today – a 28% upside from the current price. See the math behind this dynamic DCF scenario. Heading into 2019, we see two primary factors that could drive up CMI’s stock price. First, the continuation of high demand combined with the favorable comparison set up by the one-time charges in 2018 should lead to earnings beats in 2019. Investors are worried about tariffs, but the $250 million in tariff-related costs that Cummins expects are significantly below the $368 million in one-time costs they incurred this year. In addition, the debut of the electric semi-truck powertrain should be a boost for shares, especially if it comes at the same time as Tesla production issues. Once investors start seeing Cummins investments in EV’s pay off, they should reward the stock with a higher valuation. Cummins has increased its dividend in each of the past nine years. Its annualized dividend has grown $2.50/share in 2013 to $4.56/share in 2018, or 13% compounded annually. The current dividend provides a 3.2% yield. 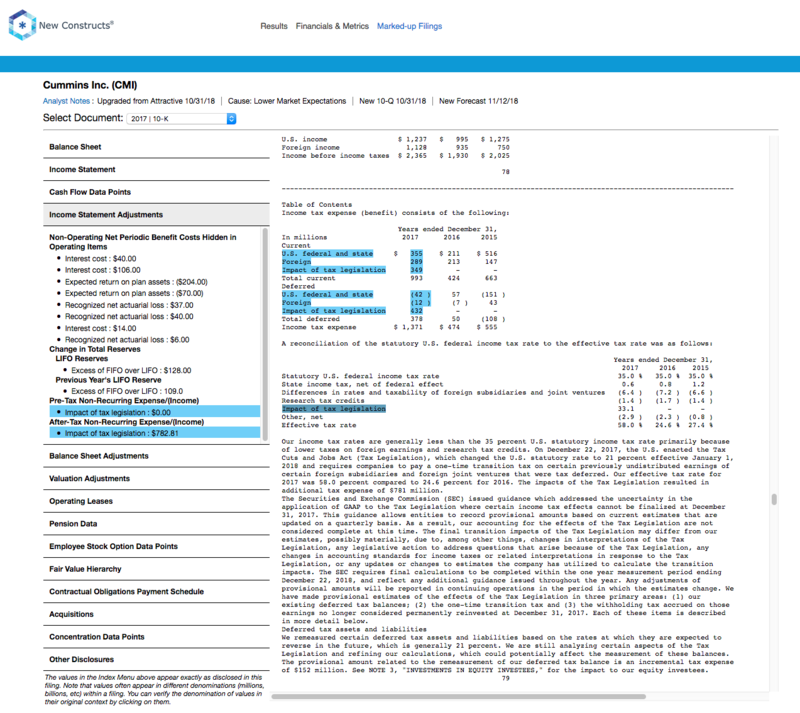 In addition to dividends, Cummins returns capital to shareholders through share repurchases. Through the first nine months of 2018, the company has bought back $879 million worth of its own stock. On an annualized basis, this comes out to $1.2 billion, or 5% of the market cap. With a recently announced $2 billion buyback authorization, there’s no reason to expect this buyback activity to slow in the future. Recent insider trading trends have been minimal. Over the past 12 months, 56 thousand shares have been bought and 52 thousand shares have been sold, for a net impact of 5 thousand shares bought (less than 1% of shares outstanding). Short interest trends have been similarly minimal. There are currently 3.6 million shares sold short, which equates to 2% of shares outstanding and two days to cover. While the market may be pessimistic about CMI’s future, investors are not eager to short the stock at this cheap valuation. Income Statement: we made $929 million of adjustments, with a net effect of removing $713 million in non-operating expense (3% of revenue). We removed $108 million in non-operating income and $821 million in non-operating expenses. 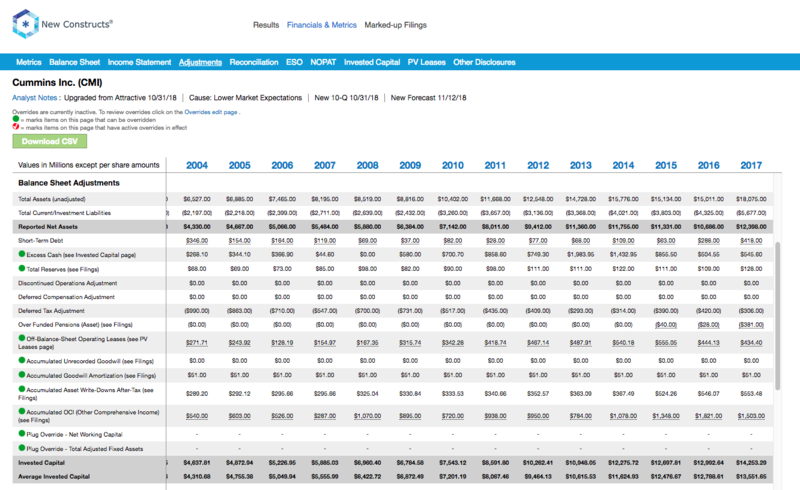 You can see all the adjustments made to CMI’s income statement here. Balance Sheet: we made $4.3 billion of adjustments to calculate invested capital with a net increase of $1.9 billion. The most notable adjustment was $1.5 billion in accumulated other comprehensive loss. This adjustment represented 12% of reported net assets. 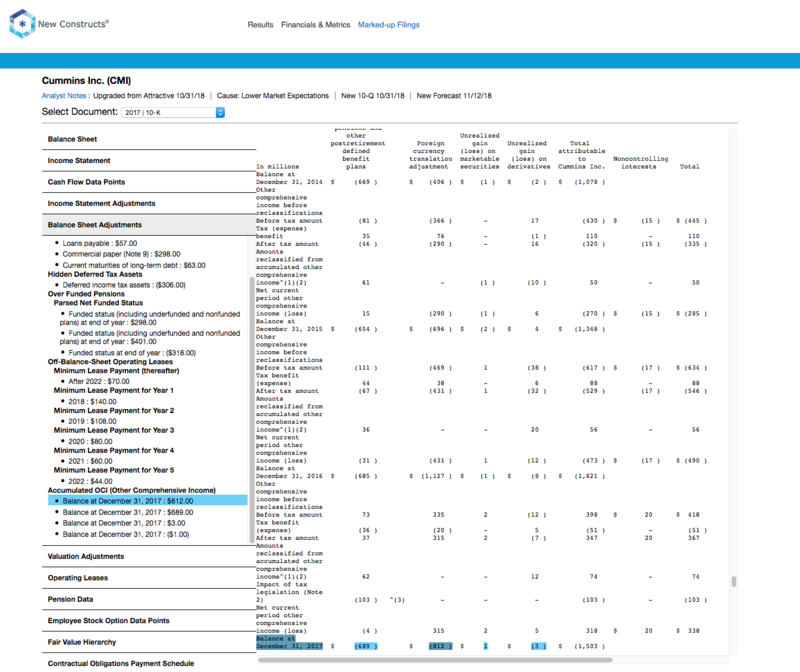 You can see all the adjustments made to CMI’s balance sheet here. Valuation: we made $4.8 billion of adjustments with a net effect of decreasing shareholder value by $3.2 billion. There were $632 million of adjustments that increased shareholder value and $3.9 billion of adjustments that decreased shareholder value. Despite the net decrease in shareholder value, CMI remains undervalued. The following funds receive our Attractive-or-better rating and allocate significantly to Cummins. This article originally published on November 14, 2018.